The search continues for Ivy Mantell, a homeless single mom and reported domestic violence victim, who went missing almost four years ago. Ivy Mantell last spoke to her sister, Corinne Conrad, over the phone around Father’s Day in 2011. Mantell was at a friend’s house and had plans to attend a barbecue later on. She didn’t know that phone call would be the last time they would speak. A few days later, Conrad repeatedly called Mantell’s cell phone and never got an answer. Mantell was reported missing a month later. Ivy Mantell when she was younger. Photo courtesy of Corinne Conrad. Mantell, 59, a single mother, was also homeless and stayed in a local shelter in Yonkers. She is also one of the many victims of domestic violence who have gone missing. Her case remains unsolved, but her family suspects foul play may have had something to do with her disappearance — in part because she disappeared without a trace. Mantell was divorced, relying on her ex-husband for child support and not working in order to stay home and take care of her autistic son Taylor, when she was evicted from her Yonkers home in 2009. The Westchester County Department of Social Services put Taylor, a teenager at the time, in a group home when Mantell became homeless. Mantell suffered from depression and anxiety while living on the streets and would drink heavily to self-medicate, Conrad says. Mantell’s alcoholism was so severe that Conrad had to bribe Mantell with a bottle of wine to get her to go to the hospital after she was hit by a car. 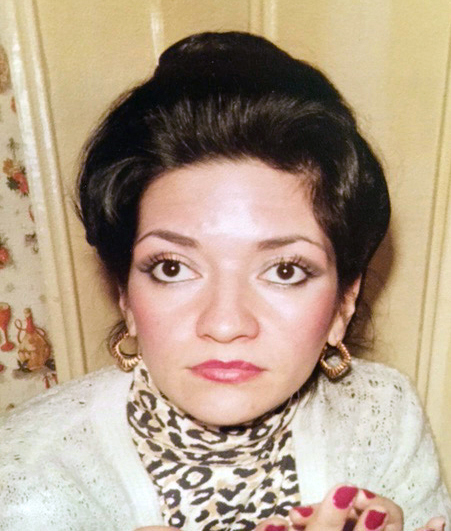 Conrad says that Mantell couldn’t stay with her in Queens because a social worker told Mantell she would lose rights to her son if Mantell moved out of Yonkers. That’s when Mantell started sleeping in a shelter and met her boyfriend, who was also homeless. Conrad says he started abusing Mantell, but that she stayed with him for protection from dangers such as attacks in the shelter. Ivan Cabrera left a turbulent home as a teenager. Almost 20,000 children were reported missing in New York State last year, and nearly all of them are suspected runaways like Ivan Cabrera. Last year, the National Runaway Safeline, an organization that works to keep runaways and homeless children safe, received more than 96,000 calls from runaways. Nearly a third were from New York, more than any other state. Most runaways — like Cabrera — leave home because of conflicts with their parents, authorities say. Read more. Photos of Ivy Mantell courtesy of Corinne Conrad. She also says that Mantell didn’t want to report him to the police. He was arrested and served at least seven months in jail when Mantell was hospitalized from one of his beatings, says John Geiss, the detective who’s working on Mantell’s open missing case. Geiss couldn’t comment further on Mantell’s case since it is an ongoing investigation, he says. The National Coalition Against Domestic Violence reports that 1 in 3 women have been victims of some form of physical violence by an intimate partner within their lifetime. Ruth Glenn, the executive of the coalition, says there are many barriers and reasons a victim doesn’t leave the abuser. Glenn also says that family and friends of victims aren’t sure what to do once they recognize the abuse. Conrad says that the boyfriend made no efforts in helping her family find Mantell. He also could not be questioned for the investigation, due to his lawyer’s protection. Joseph Giacalone, a retired NYPD detective sergeant who worked on homicide and missing persons cases, says that most detectives will initially treat a missing case as murder and suspect the missing person is deceased based on gut feelings. But detectives don’t want to diminish the hopes of the family.